Can I custom the title of flipping book on MAC version? If you have used FlipBook Creator (Pro), you would know of the title of flipping book. Similarly, you can custom the title on MAC FlipBook Creator. It is a literal brand or watermark of your organization or company. Please don’t look down upon it. The left-top literal brand is an important advertisement for most of people who visit your flipping book. You know, base on a result from an official webpage viewing search, people would view the left-top area of one webpage. The literal brand is just on the hot area let-top. 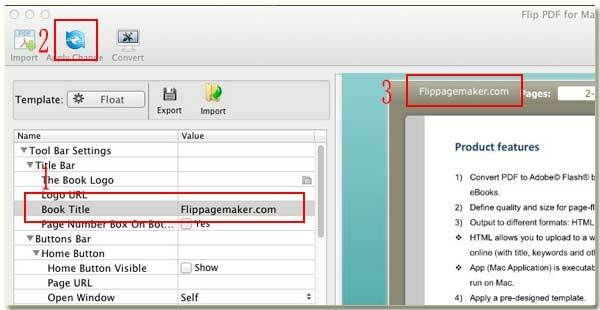 Anyway, we can’t let it pass us by, let’s learn how to custom flipbook title on FlipBook Creator for MAC. Step1: Move your eye to the left settings area. Step2: Go ahead to the options “Tool Bar Settings --> Title Bar --> Book Title”. Step3: In the afterward form, enter the literal brand. Step4: Click the top icon “Apply Change” to apply the new left-top brand to the flipping book.